Wayne C. Smith, Lock Haven, "stitched" individual photos to create this composite panorama. Looking northwest up the West Branch Susquehanna River valley. Here, PA Route 120 crosses the river and heads toward Renovo. Much of the surrounding terrain lies within the bounds of Sproul State Forest. 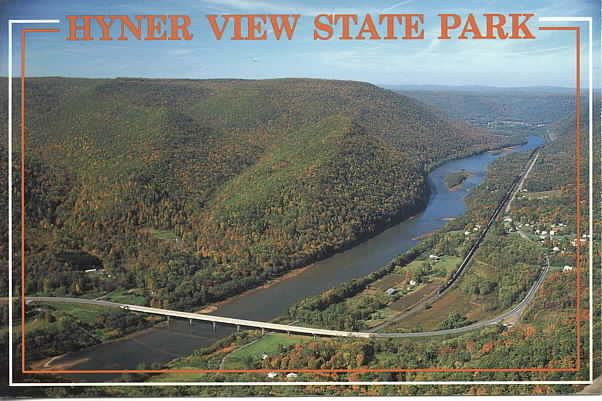 Hyner View and Hyner Run State Parks take their name from a small creek draining the adjacent mountains through a steep-sided valley and flowing into the river. The impressive stone- wall was built in the 1930s by Civilian Conservation Corps (CCC). Downstream vista. From here, the West Branch Susquehanna River cuts through the Plateaus to the southeast. PA Route 120 follows the valley. Lock Haven, about 30 miles downriver, lies in Bald Eagle and the West Branch Valleys, the first valley of the Ridge and Valley Physiographic Province toward the south and east. Approaching from PA Route 120, turn onto Hyner Mountain Road (PA 1014) and travel two miles. Turn right onto Hyner View Road. This narrow, paved road, with its many twists and turns, rises steadily for five miles and leads directly to the overlook. From PA 44, take Hyner Mountain Road (SR 1014) for 0.75-mile, turn left onto Ritchie Road. Travel 2.4 miles, turn right onto Hyner View Road. When the dirt road intersects the paved road, turn left and travel for 1 mile. 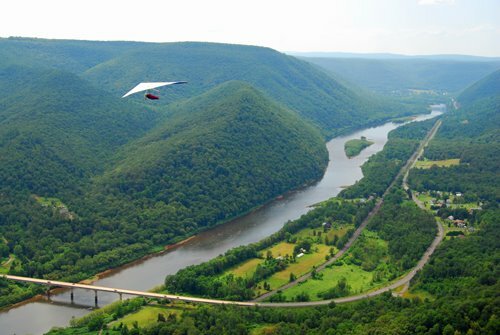 A hang glider soars high above the West Branch Susquehanna River. Hyner Vista is a favorite for flight enthusiasts and attracts many devotees who take advantage of the spectacular views while enjoying the thrill of the ride! This photo accompanied a blog entry titled: Conservation Deal Keeps Hyner Hang Glider Landing Zones Viable posted on August 28, 2008 by Mike Eckley. Marta's blog features this postcard illustrating the down-river view from the Hyner Overlook. Marta is from Seixal, Portugal. 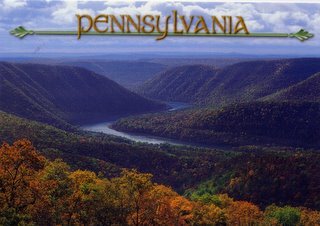 This portion of Pennsylvania's Appalachian Plateaus, the Deep Valleys Section, displays topography that contrasts with the upland regions to the southwest and northeast. Physiographic Province Map of PA (PGS Map 13) and the Geologic Map of PA (PGS Map 7) illustrate some of these differences. Red Hill, an unusual Late Devonian (Famannian Stage) fossil site, is located just west of Hyner Run State Park, Clinton County, central PA. This sequence of interbedded red mudstone and siltstone units were formed about 360 million years ago by a large lowland river which meandered across an extensive floodplain. An impressive variety of animal and plant fossils (rare, spore-bearing plant to the right) have been recovered from this site. Remarkable skeletal elements from the vertebrates Designathus rowei and Hynerpeton bassetti have received much attention because they are currently considered the earliest four-footed fishes (tetrapods) which were able to walk on land. Thus, they mark the transition in evolution of aquatic fishes to amphibians. The jaw of the tetrapod Designathus rowei found at Red Hill. Ctenacanthus spine showing the intricately notched pattern. About two miles north on PA Route 120 from Hyner Run State Park is a very important vertebrate fossil site called Red Hill. 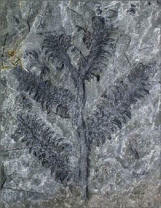 Fossil fragments of early amphibians, reported to be from the oldest tetrapods found thus far in North America, were recovered from this site by paleontologists Ted Daeschler, from the Academy of Natural Sciences in Philadelphia and a colleague Neil Shubin, from the University of Pennsylvania. Local paleontologist, Doug Rowe, often can be seen on the outcrop, hard at work to uncover new material (the jaw to the left bears his name) and introducing visitors to this unique geologic site. "Read All About It" in the Devonian Times. Please Note: All material on this website is, unless otherwise stated, the property of (John H. Way, Bald Eagle Geotechnical Services). Copyright and other intellectual property laws protect these materials. Reproduction or retransmission of these materials, in whole or in part, in any manner, without the prior written consent of the copyright holder, is a violation of copyright law.